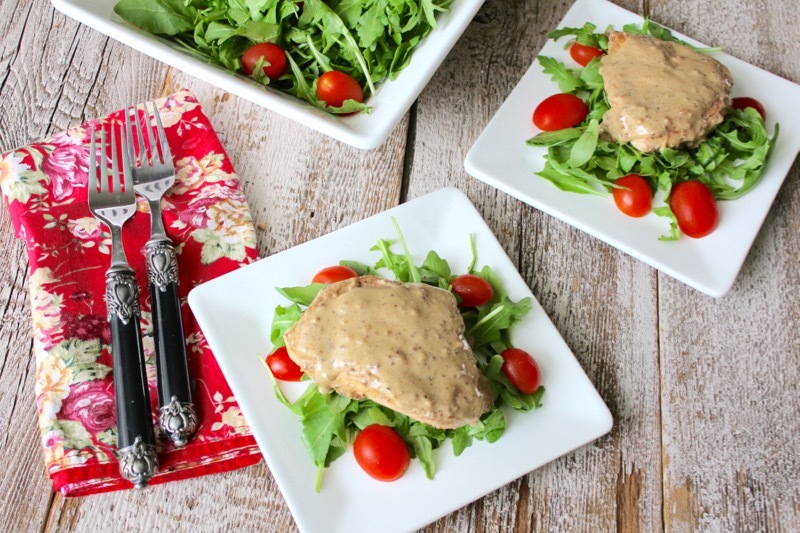 When something light but still decadent is desired, you can’t do better than a boneless chicken breast smothered with a double mustard cream sauce over baby arugula. You might call this a juxtaposition of good and bad. 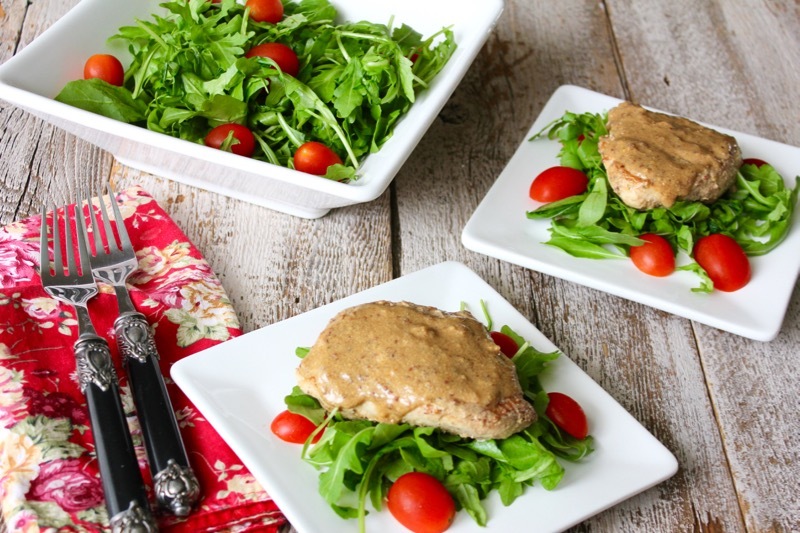 The goodness of lean chicken and vitamin packed baby arugula with the richness of alcohol spiked cream and mustard. While visiting the family over the holidays, my DIL Kristen made a similar dish, sans the alcohol, for dinner one night. It was amazing watching the children digging into the chicken. The arugula was also slathered with the sauce and they ate every bit of it. It is a great way to get your kids to eat vegetables. We loved it too, so I did a Google search for something similar. The Pioneer Woman came to the rescue. Granted her version had a whole cup of brandy in it, as opposed to what Kristen made, but it was really, really good. I ended up having to substitute Madeira and white wine instead of the brandy. Inexplicably, the liqueur cabinet here in Florida held no brandy. 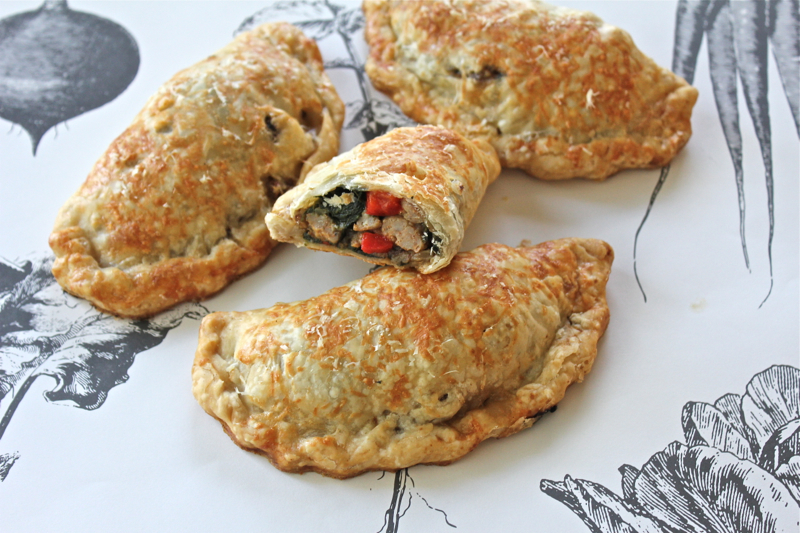 Be sure to visit Ree’s site for a complete pictorial on how to make this great dish. It couldn’t be easier. 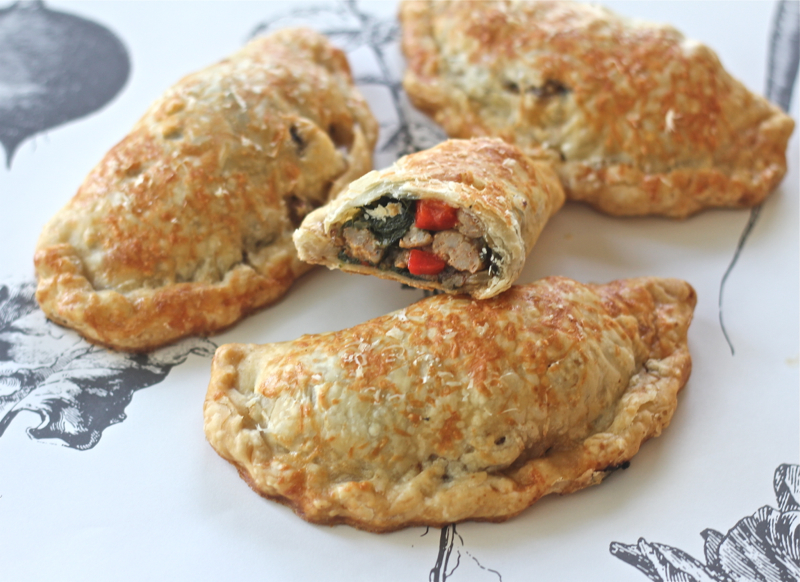 On its own, this would make a great luncheon dish or a light supper. Add sides for a more complete dinner. Hope you give it a try. Posted on January 13, 2016 at 11:21 am. Posted on February 21, 2015 at 9:16 am. Asheville North Carolina is a mecca for fine dining. 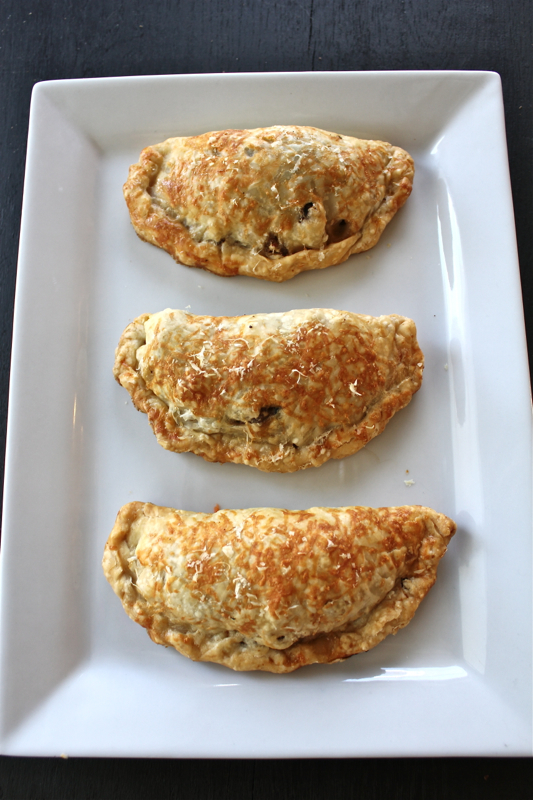 One of the top hot spots in town is a Mediterranean restaurant called Rezaz (pron. “ray-zuhs”), located just blocks from the entrance to The Biltmore Estate. 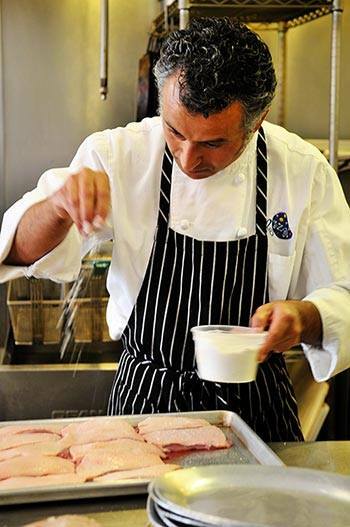 Chef/ owner Reza Setayesh has traveled and trained widely resulting in a worldly palate. 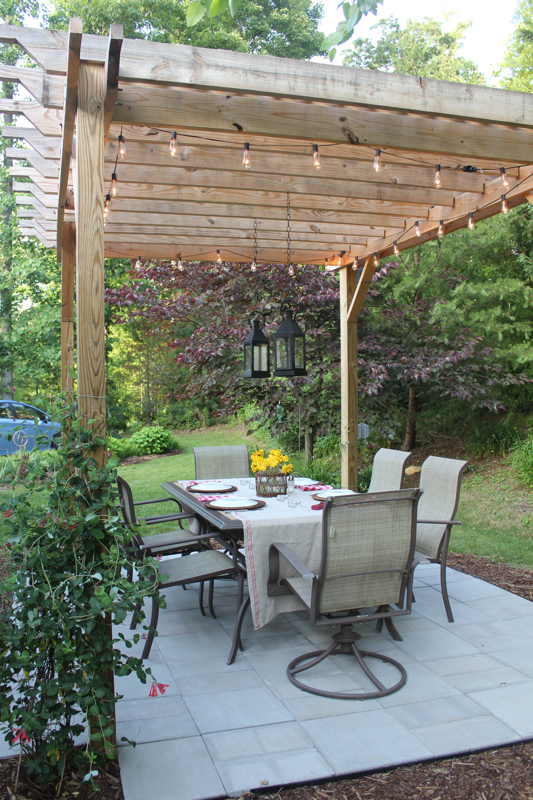 His emphasis in the dining room is on Eastern Mediterranean cuisine, but at his Chef’s Table anything goes. He loves to give free rein to his culinary expertise. 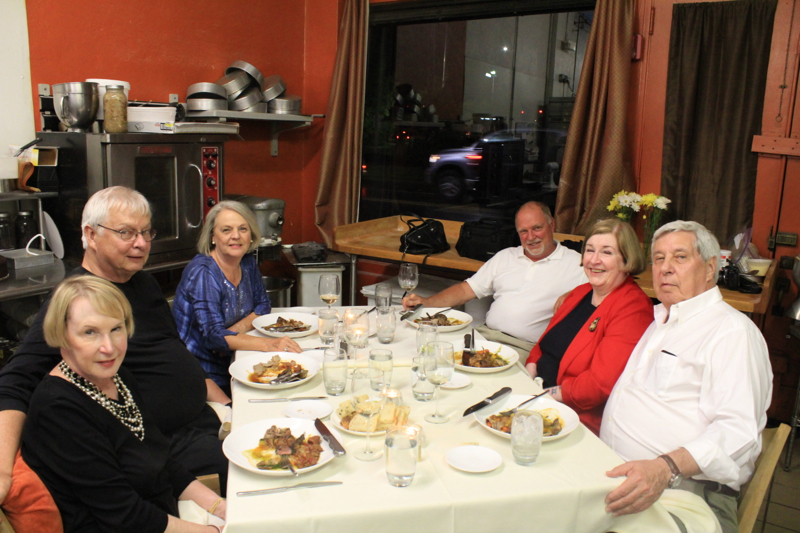 When Sam ( My Carolina Kitchen ) and her husband Meakin invited us to join them, along with BIL and SIL Stuart and Sandy, for a chef’s table dinner we immediately accepted. 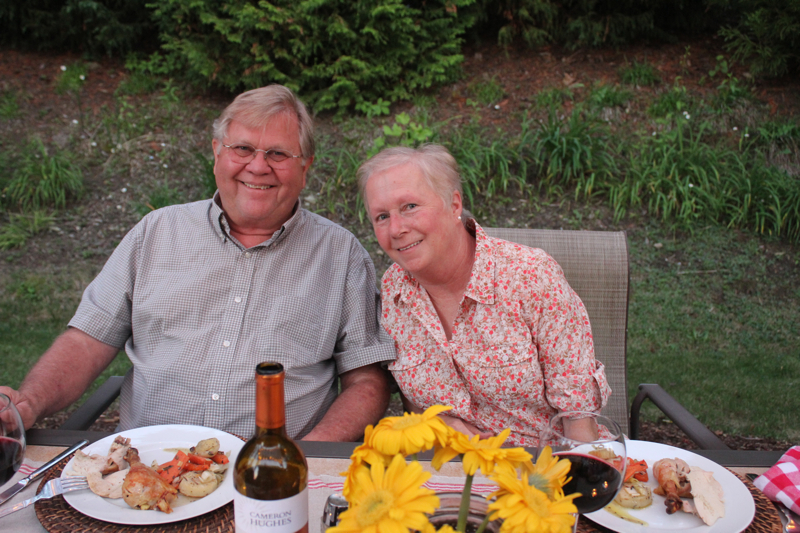 Meakin arranged for us to enjoy a 5 course French Provencal dinner with wine pairings. The kitchen was warm and inviting on a rainy night. A nice touch was the pandelier overhead. 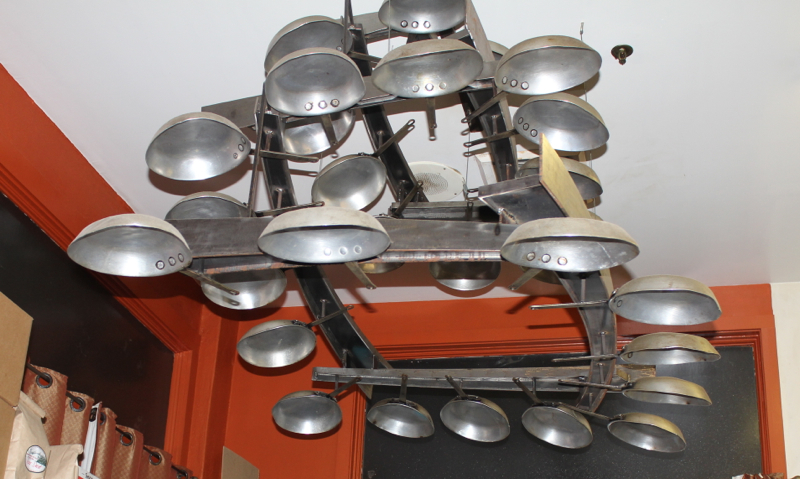 It is a metal sculpture made from saute pans used during the restaurant’s first decade. 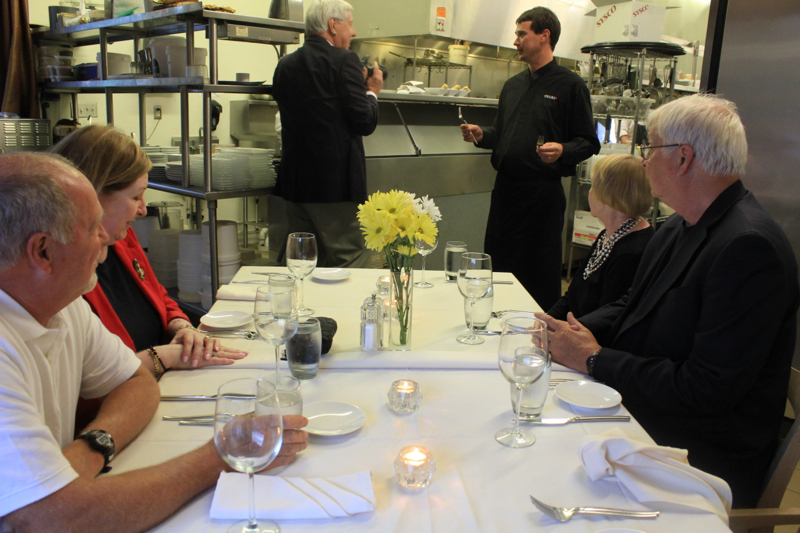 We were fortunate to have a highly trained waiter to explain all of the chef’s dishes to us. Our anticipation was rewarded with the following courses. The first course consisted of three seafood preparations. At the top left is a Smoked Salmon Rillette served with a toasted baguette and sliced radishes. Bon Appetit has a similar recipe here. Next to the salmon is Moule Curry (Mussels in a curry sauce with breadcrumbs). 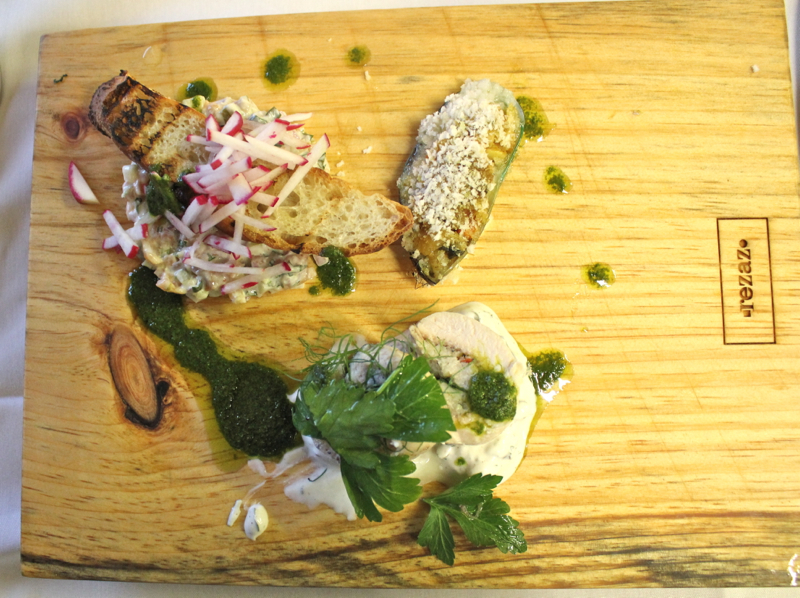 At the bottom is a Trout and Crab Galantine ( A Trout roll stuffed with crab) with arugula pesto. 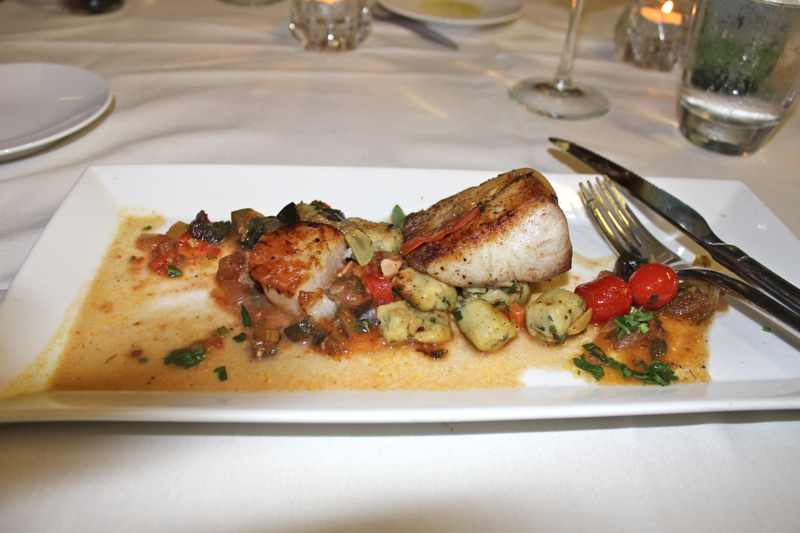 Our second course was a Pan Seared Sushimi Grade Cobia (Swordfish) a la Provencal, Sauteed French Gnocchi, Seared Scallops and Summer Vegetable Ratatouille. My, oh my, this was delicious. 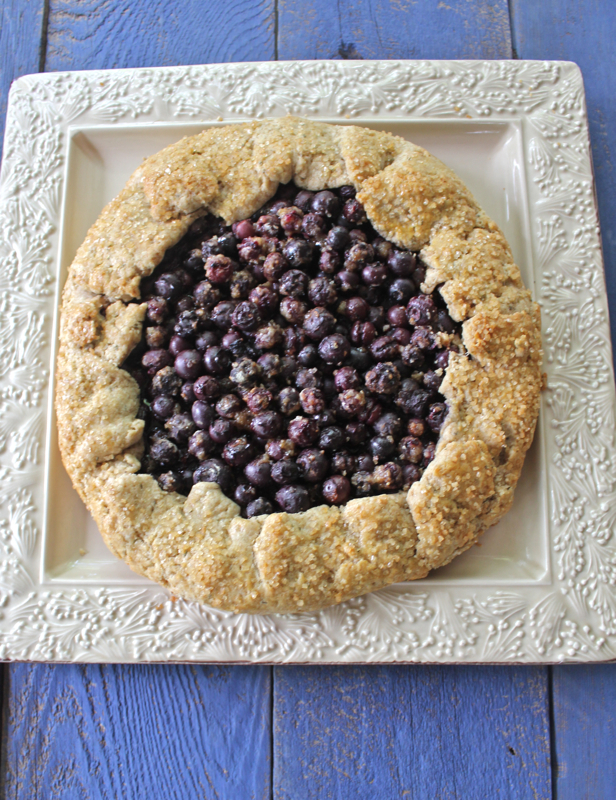 Summer on a plate for sure. The next course was one of my favorites. 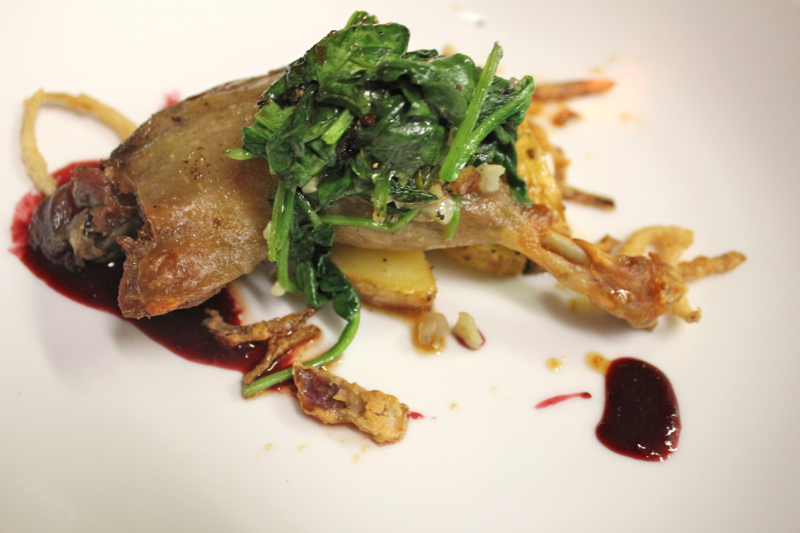 It was a Duck Leg Confit in a Cherry Gastrique Sauce. 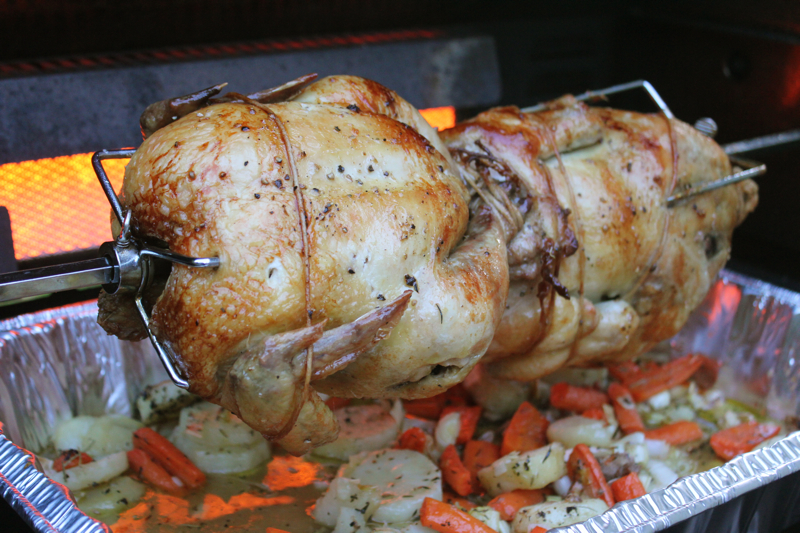 The duck was moist and crispy from cooking in its own fat. With it were Yukon Gold Potatoes and Sauteed Spinach. 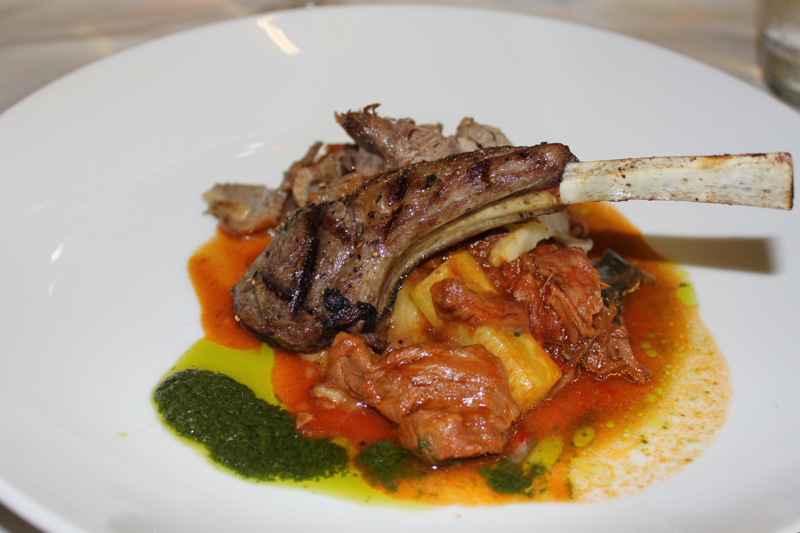 The next entree course was a study of three lamb preparations; a Grilled Lamb Chop, Lamb Navarin (Stew) and Lamb Gigot (Roast with French thyme and wild rosemary). It was served with a Parsnip and Potato Mash, and an Arugula Pesto. It was wonderful, but we were getting full. 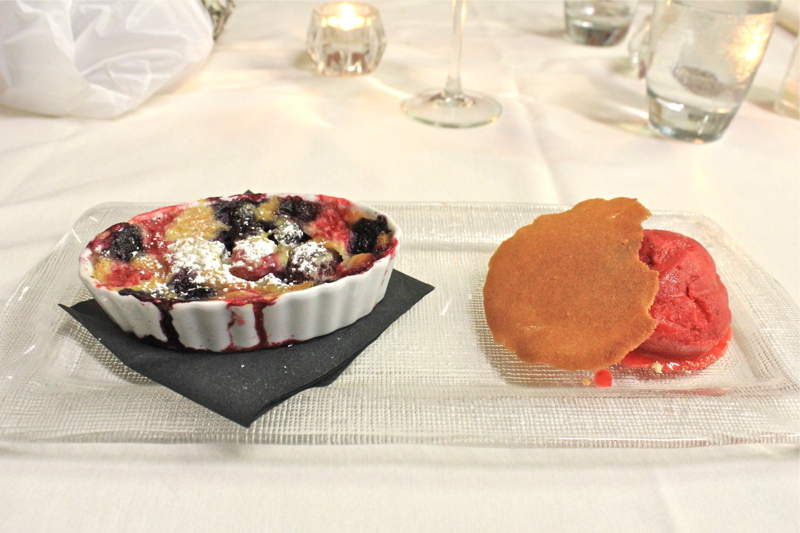 For dessert we had a Summer Berry Clafouti and a Lemon and Berry Sorbet with a Touille Cookie. The sorbet was so refreshing and the clafouti was just the right size. 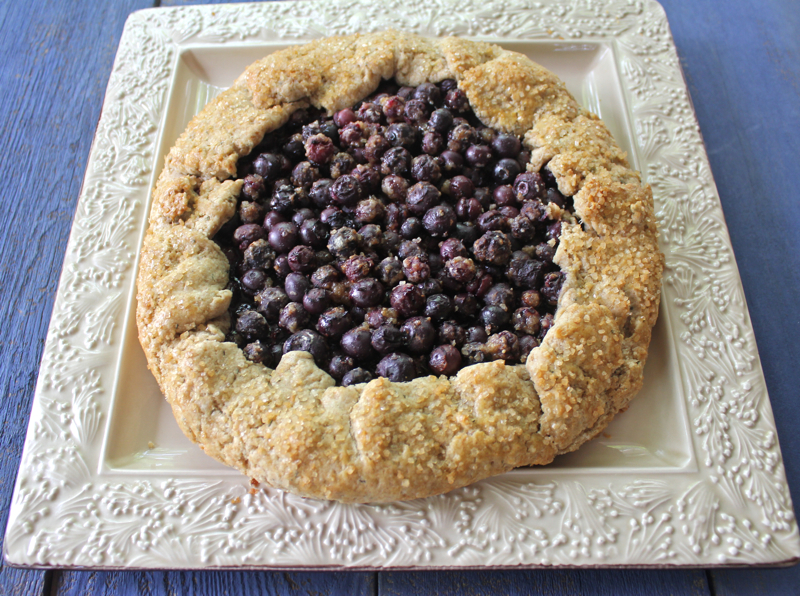 Next time I make one, it will be a bright mix of berries like this. As we drove back over the mountain from Asheville to Lake Lure we were sated, happy and thankful that we could spend such a lovely evening with friends. It was a truly memorable experience. Posted on September 21, 2014 at 7:59 am. 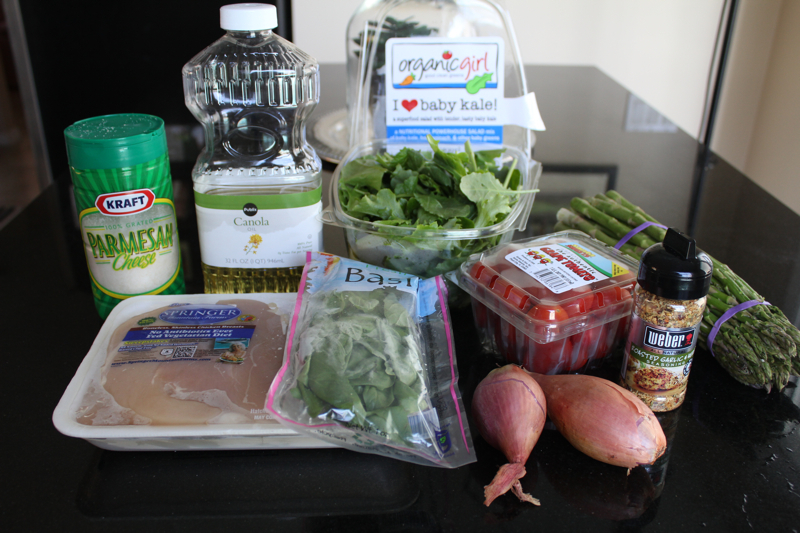 To continue the Greens of Winter theme, I made this flavorful and simple chicken dish that utilizes convenient store-bought products. 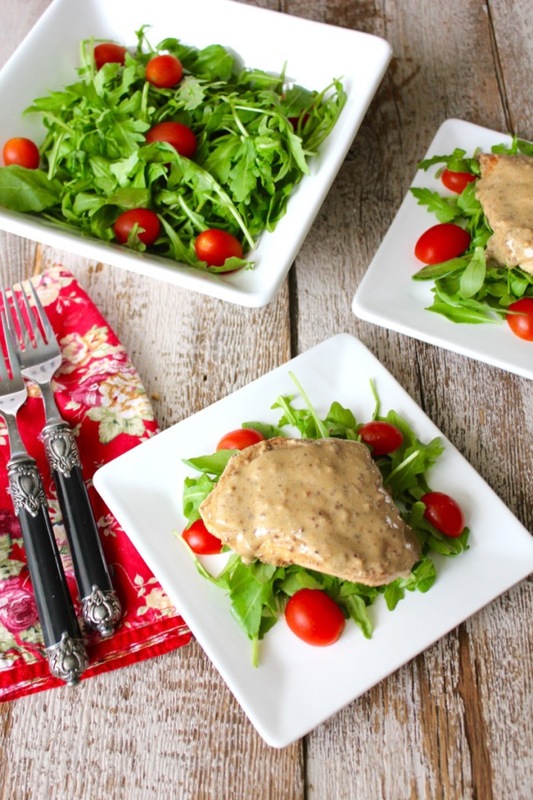 It was a featured recipe in Publix’s Aprons Simple Meal Program. Every week they feature recipes from products on their aisles. All of the ingredients are gathered at the cooking station so that, if, after sampling the dish and it is to your liking, you can gather all of the ingredients to make it; all in one place. Genius! Here are the major players in the dish. I forgot to include the red wine vinegar and the sugar, but you get the general idea. The Aprons Program is a wonderful idea for harried cooks and working families who have very little time to shop, but still want to serve their families home-cooked meals. 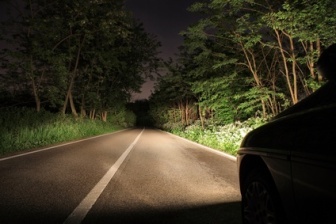 This was almost just as simple as ordering a pizza or stopping for take-out chinese food. Nutritionally there is no contest. 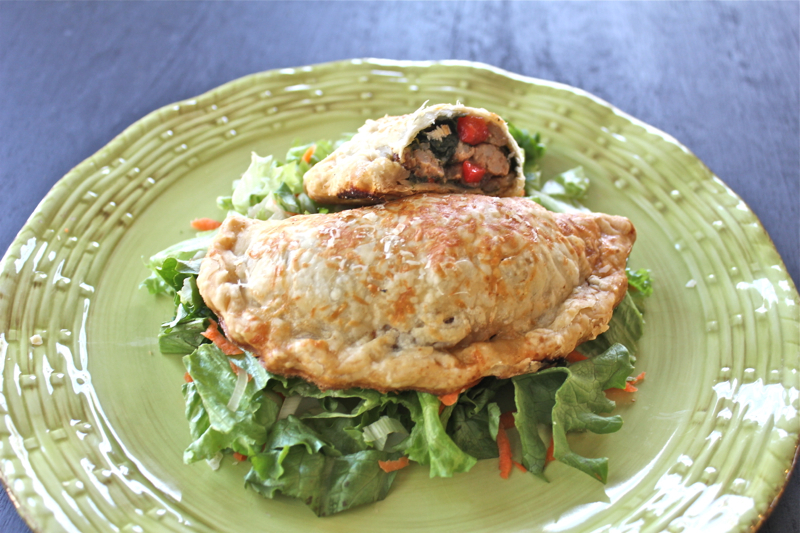 It is low in fat and full of healthy ingredients. The only addition I made to this meal was a pot of mashed potatoes. A brown and wild rice mix would also be good. I think we are off to a great start in the New Year. PREP: Chop shallots and basil. Cut asparagus into 1-inch long pieces, removing tough root end. 1. Preheat large saute pan on medium-high 2-3 minutes. 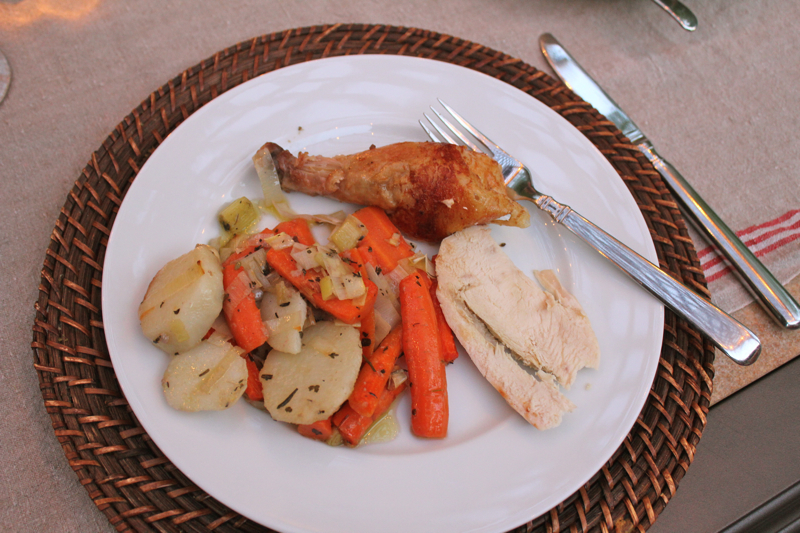 Season chicken with 1 teaspoon garlic/herb seasoning (wash hands). Place oil in pan, then add chicken; cook 4-5 minutes on each side or until browned. 2. Reduce heat to low. Stir in tomatoes and shallots; cook and stir 2-3 minutes or until tomatoes are softened. 3. Combine vinegar and sugar, then stir into tomato mixture; cook 8-10 minutes, turning chicken occasionally, or until liquid has reduced by about one-half and chicken is 165 degrees F. Remove chicken from pan; let stand 5 minutes to rest. 4. 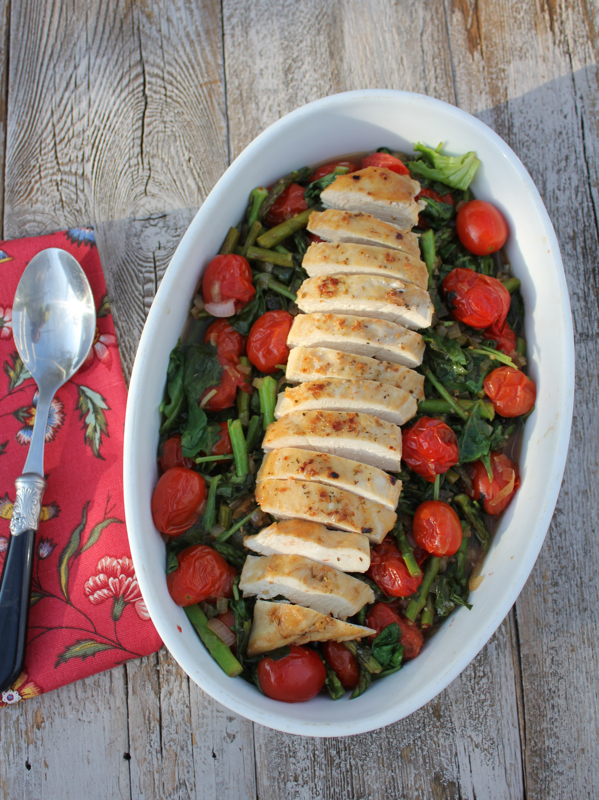 Stir kale, basil, asparagus, and remaining 1/4 teaspoon seasoning into tomato mixture; cook 1 minute or until salad is wilted. 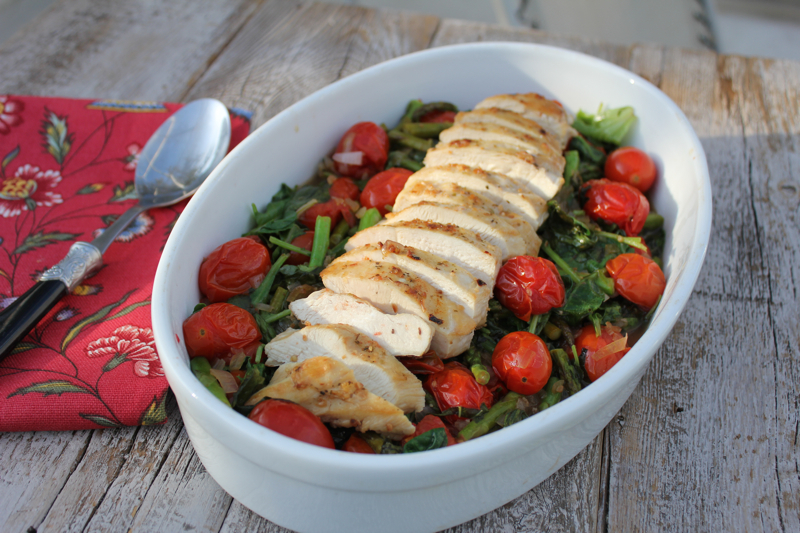 Transfer salad to serving plates; slice chicken and arrange on top of salad. Sprinkle with cheese; serve. Serves 4. Posted on January 8, 2014 at 8:19 am.